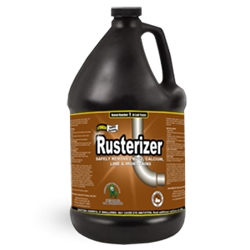 My Cleaning Products recommended Rusterizer for an effective post-winter rust removal process. The company said that it is organic-based so it is also safe for health. Moisture is a primary source of corrosion. Because of that, My Cleaning Products said that the public must be ready to clear rust promptly come the post-winter season. But to make the process effective and safe, it only recommended the use of an organic rust removal spray. Rust basically occurs when the oxygen in moisture mixes with the iron in metal. And unless either of the two is completely consumed, the corrosion will go on. Given that in a few months, winter will end, MCP said that corrosion is to be expected. The melting of the snow, it stated, would create numerous sources of moisture that could result to rust formation on anyone's metal items, including automobiles. For that reason, the company said that it would be best for anyone to be ready to remove rust as soon as winter ends. That way, one could prevent the worst of its effects and salvage the items from total ruin. In addition, that also spares a person from expenses for costly repairs and replacements, it stated. To be able to clear rust personally and promptly though, My Cleaning Products cited that one would need the help of a rust removal spray. Without it, it said that it would take hours to scrub the corrosion away. It stain could also stay permanent, especially on fabric-made items. Nonetheless, MCP pointed out that not just any solution would work in a rust removal process. It said that the treatment needs to be effective and safe so the product to use must not contain harmful chemical ingredients. And as Rusterizer is organic-based, it only recommended the use of it. In the absence of harsh chemicals in its content, Rusterizer leaves no harmful residues when sprayed, the company stated. That makes it safe for health and even the environment, it cited. Moreover, it shared that rust contractors have already proven that it is truly effective. To test it, MCP urged everybody to try the Rusterizer Complimentary Sample. It relayed that it is available at its website at mycleaningproducts.com.